Forages as a group are made up of many different types of plants, including grasses, legumes and other forbs, and shrubs. Most forage species, however, are grasses. Understanding grass growth is crucial information for a livestock manager. Grasses can be extremely productive when managed properly because they will grow back throughout the season when defoliated (grazed or mowed) properly. In fact, grasses will be healthier and more productive when defoliation occurs at the right time and in the right way. To maximize grass growth and therefore yield, knowledge of grass growth must be understood and appropriately applied. The first step in understanding grass growth is an awareness of the different groups into which grasses can be categorized. Grasses can have annual or perennial life cycles, tall or short statures, jointed or non-jointed regrowth mechanisms, sod or bunch growth habits, warm or cool-season responses to climates, and requirements or no requirements for vernalization. The labeling of plants as annuals, biennials, or perennials goes back to the early Greeks. Plants with annual life cycles complete their growth cycle in a single growing season (which is not usually an entire year), and are perpetuated by seed. The major row crop plants of the world are annuals; corn, rice, wheat, and barley. Biennials are plants that take two seasons or years to complete their growth cycle. The first year is a time for accumulating food reserves in storage organs. The second season produces reproductive flowers and seed. Some of the root crops, such as beets, carrots, and parsnips, some ornamental shrubs like hollyhock, and some vegetables like onions and cabbage are biennials. There are no common biennial grasses. Perennials are plants that continue to grow indefinitely. Some may die back to the ground each winter (herbaceous perennials), but revive from the roots in the next spring. They propagate by tillers and seeds. Many of the forage grasses function in this way. Most perennial plants add new growth each year as trees do. Some species, especially tropical forms like the tomato, are perennials but are cultivated as annuals in certain climates. Some annuals can be managed to be short-term perennials. 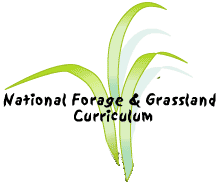 This general understanding of plant classifications will help grass managers to understand the normal cycle of their grasses and help them make decisions on how to select forage species and maximze their production. perennials: orchardgrass, tall fescue, perennial ryegrass, kentucky bluegrass, smooth bromegrass, meadow foxtail, timothy, colonial bentgrass, bermudagrass, reed canarygrass, wheatgrasses, big bluestem, switchgrass, and indiangrass. Grasses vary in size from very small species only 0.79-1.18 inches (2-3 centimeters) to giant bamboos measuring 98.4 feet (30 meters) tall. A few species even grow prostrate along the ground which is common in legumes but not so common in grasses. Understanding the potential size and erectness of grasses can add to successful decision making for forage managers. Most references to grasses list grasses as tall or short and some grasslands are characterized as tall or short-grass prairies, with some overlapping. The Great Plains region of North America is known as one of the largest grassland areas in the world. It extends east to west from the deciduous forests of the east to the foothills of the Rocky Mountatins. There is a west to east gradient of increasing precipitation and, of course, a gradient of increasing temperature north to south. Some have divided the Great Plains into four prairie sections: tall grass, mixed grass, short grass, and fescue. Thousand of years of grass growth and regrowth in the Great Plains resulted in tremedously fertile soil which is now mostly used for crop production. The tall grass prairie is mainly made up of warm-season grass species like big bluestem, little bluestem, indiangrass, and switchgrass. These species thrive with higher precipitation. Precipitation is a direct factor in tall grasses. Tall grasses are also often located near ditches, riparian zones, and other areas where water collects. Tall grass prairies extend from Texas north into Manitoba. Short grass prairies are dominated by blue grama and buffalograss. The semiarid climate east of the Rockies, from Texas to Saskatchewan supports these shorter grasses. The mixed grass prairies are transition grasslands containing a mixture of tall and short grasses. This is a result of intermediate precipitation in Kansas up into Canada. In the foothills of the Rocky Mountain range, the prairies consist of fescues and oatgrass. The major tall-grass prairies of the Midwest and Great Plains were quite overwhelming to early settlers. Tall-grass prairies have been described as oceans, and some found them too vast to cross. After the American Revolution, settlers and pioneers waited almost 40 years (1840-1880) before inheriting 700 million acres (283 million hectares) of bountiful prairies. Without large numbers of domesticated animals and plows, the tall-grasses seemed too massive to control. Pioneers felt more comfortable with trees and felt land that grew only grass was inferior. They mistakenly reasoned that if there wasn't enough rain for trees, then there wouldn't be enough rain for crops. They avoided the "Great American Desert". Some historians felt that the Indians (Native Americans) of the prairies were more feared than Indians (Native Americans) of the woodlands and this feeling contributed to the slow acquisition of the prairies. Other practical factors entered into the matter: few navigable rivers, the different prairie soil did not respond to the plows available, few railroads extended into the prairie, settlers often did not own enough horses and mules, few available trees for building homes, fences, tools and fuel. So, much of the tall-grass prairies was given away. Without understanding the needs and growth habits of grass, the immense prairies were almost destroyed within 50 years. By the time of the Dust Bowl the prairies were in grave danger. Tall grasses are those that grow erectly over 3-4 feet (0.9-1.2 meters) high and include switchgrass, big and little bluestem, and Indiangrass. Their stature must be supported by adequate precipitation. The short grasses are blue grama, buffalograss, annual bluegrass, and western wheatgrass. Most of the common forage grasses, perennial and annual ryegrass, orchardgrass, bermudagrass, kentucky bluegrass, and tall fescue are erect but not considered tall grasses. Sod-forming grasses have strong, creeping rhizomes that extend through the soil or have stolons that grow above ground, producing new plants when they root at the nodes. This type of growth that extends out into the soil is called extravaginal growth. New plants (shoots) develop either from buds (encasings) in crown tissue or from apical meristem at the tips of rhizomes and/or stolons. The Bromus and Agropyron species are sod grasses, sometimes called "sod formers." Bermudagrass, creeping bentgrass, Kentucky bluegrass, and St. Augustine grass are sod grasses. Tall fescue has lower, lateral growth but is not aggressive. Creeping foxtail and smooth bromegrass are very aggressive and need careful management to not become pests. Bunchgrasses grow from intravaginal tillering at or near the soil surface without rhizomes or stolons. New plants (shoots) arise from buds within basal sheath tissue and grow up from within the plant forming distinct clumps or tufts of vegetation. Bunchgrasses can eventually cover a pasture with a good stand but sod grasses can do so much more quickly. While empty space exists between bunchgrasses the opportunity for weed infestation is greater. Bunchgrasses can be more productive than sod-formers because they are putting all their energies into above ground structures which can be utilized. Sod formers have structures at ground level and below. The following lists designate the sod-forming or bunchgrass growth habits of the common forage grasses. Sod-forming grasses: kentucky bluegrass, creeping foxtail, colonial bentgrass, bermudagrass, quackgrass, rough bluegrass, annual bluegrass, and redtop. Bunchgrasses: perennial ryegrass, annual ryegrass, timothy, orchardgrass, meadow foxtail, and tall fescue. Understanding warm-season (C4) and cool-season(C3) plants. Although animals eat all year round, there is no "all season" plant to use as forage. Knowing that some plants are C3 (cool season, temperate) and some plants are referred to as C4(warm season, tropical) is a basic key to having quality forage all year long. But understanding the physiology (internal chemical changes) of both can even further improve the management of forages. The science: C4 and C3 plants both utilize photosynthesis which is a chemical process in which light energy from the sun is captured and mixed with water and carbon dioxide to make sugars which are used as food for chemical energy. The science: C3 plants are called temperate or cool season plants and reduce (fix) CO2 directly by the enzyme ribulose bisphosphate carboxylase in the chloroplast. The reaction between CO2 and ribulose bisphophate, a phosphorylated 5-carbon sugar, forms two molecules of a 3-carbon acid. This 3-carbon acid is called 3-phosphoglyceric acid and explains why the plants using this chemical reaction are called C3 plants. The 3-phosphoglycieric acid molecules move out of the chloroplast to the cytoplasm and are used to make hexose, sucrose and other compounds. The enzyme ribulose bisphosphate carboxylase also triggers a reaction where oxygen splits ribulose bisphophate into a 2-carbon acid and a 3-phosphoglyceric acid. The 2-carbon acid is respired to carbon dioxide and basically a loss to plant function. 15-40% of the light energy taken into the C3 plants is lost in this process called photorespiration. The percentage goes up in higher temperatures, so C3 plants use more available oxygen in cooler environments. The ramifications: C3 plants have an optimum temperature range of 65-75 degrees F (18.3-23.9 degrees C). Growth may begin when the soil temperature is 40-45 degrees F (4.4-7.2 degrees C). C3 plants become less efficient as the temperature increases but have higher protein quantity. The lower temperatures in early spring also affect the existence of other organisms so C3 need nitrogen in the spring because of low microbial action in the soil. Cool-season grasses are productive in the spring and fall because of the cooler temperatures during the day and night, shorter photo period, and often higher soil moisture. During the summer, growth is reduced and dormancy is induced by high temperatures and low precipitation. However, when temperatures drop and moisture is more available growth resumes, so fall is a productive time. There is some evidence to show that warm- and cool-season grasses form seedheads differently. Cool-season grasses may require short days and/or low temperatures in the fall or early spring (a vernalization period) before the seedhead develops from the meristem (growing point). There also seems to be need for a tiller (shoot, new plant) to reach a certain size before vernalization can commence. Timothy does not require this vernalization. C3 plants can also be annual or perennial. Annual C3 plants include wheat, rye, and oats. Perennial C3 plants include orchardgrass, fescues, and perennial ryegrass. The degradation of C3 grasses in the rumen of an animal is often faster than C4 grasses because of the thin cell walls and leaf tissue and are therefore often of higher forage quality. C4 plants are often called tropical or warm season plants and reduce carbon dioxide captured during photosynthesis to useable components by first converting carbon dioxide to oxaloacetate, a 4-carbon acid. This gives the reason for the plants being referred to as C4 plants. Photosynthesis then continues in much the same way as C3 plants. But during this type of photosynthesis, the process is very efficient and little oxygen is lost to the environment. The ramifications: C4 plants are more efficient at gathering carbon dioxide and utilizing nitrogen from the atmosphere and recycled N in the soil. They also use less water to make dry matter. They grow best at 90-95 degrees F (32.2-35 degrees C). They begin to grow when the soil temperature is 60-65 degrees F (15.6-18.3 degrees C). Forage of C4 species is generally much lower in protein than C3 plants but the protein is more efficiently used by animals. (WHY?) Warm-season grasses are specifically triggered by daylengths so latitudes should be considered in selecting warm-season grass species. They are most productive during the warmer summer months. Often, cool-season and warm-season are both used to provide forage throughout much of the year. C4 plants can be annual or perennial. Annual C4 plants include corn, Sudangrass and Pearlmillet. Perennial C4 plants include Big Bluestem, Indiangrass, Bermudagrass, Switchgrass, and Old World Bluestems. Although grasses are often defined as mostly herbaceous, monocotyledons with jointed stems, there are references to grasses being jointed or nonjointed. This distinction has definite implications in grass growth/regrowth management. Grass plants emerge from the soil as small seedlings but within the tiny structure are many nodes (masses of tissue) that will eventually be pushed upward. The nodes appear as bulges or joints in the grass stem (culm). As the plant grows climatic conditions induce the space between the nodes, called the internodes, to grow and extend, elongating the plant. This growth characteristic is what is referred to as "jointed" when grasses are defined as mostly herbaceous, jointed monocotyledons. All grasses go through this process from germination to maturity, but some grasses, such as annual ryegrass, timothy, and smooth brome, repeat this process after the seed head has been removed. These plants have jointed stems (culms) in the second (aftermath) growth. Other grass species, like perennial ryegrass, orchardgrass, and tall fescue do not. In addition to having a regrowth that again elevates the growing point by elongating the internodes, it is important to realize that grasses differ in their proclivity to produce mainly reproductive culms (stems) or vegetative culms. In any given plot of grass plants, not all plants and/or their tillers will produce a reproductive seedhead. A percentage of plants/tillers will be sterile and remain vegetative. Some species characteristically have a high percentage of floral tillers compared to vegetative tillers. Bromegrass produces many reproductive (floral) culms and few sterile or vegetative tillers. They are, therefore, more sensitive to poor management because the abundant floral tillers have elevated growing points that are vulnerable to grazing or mowing. Species that have many sterile tillers will have many growing points remaining low in the plant and therefore will not be removed easily by grazing. Grasses like bromegrass have quickly disappeared from pastures when managers did not realize bromegrass has mostly floral tillers and that the growing point is elevated in each regrowth. Grazing often removed the growing point. Successful pasture management requires an understanding of physiological (internal chemical) and morphological (external structural) stages of plant development. Each stage is linked in some manner to forage quantity, quality, and plant survival. Wise managers should learn to spot the obvious and more subtle structural changes in order to predict what is happening inside the plant. This monitoring provides the basis for good management decisions. It allows a manager to know when to graze or mow in order to ensure prompt competitive regrowth and persistence of the forage plants. One of the physiological characteristics of grasses that is important to understanding grass growth is vernalization. Some grass species, like perennial ryegrass, will hasten the development of flowers and fruit (seedhead and seeds) if they experience a period of cold weather. Some of the morphological changes in grass plants need to be understood for proper management. Growth stages of major interest are listed below along with brief management implications. Within a seed, when conditions are right to begin germination, specific cells within the germ tissue divide and expand, pushing the apical meristem contained in the seed out of the seed. A tube-like organ called the coleoptile protects the first leaf blade while pushing through the soil, eventually breaking through the crust of the soil. Then the first leaf unfurls. A node (joint) at the base of the coleoptile is also pushed up towards the soil crust within a few centimeters of the soil surface by the elongation of an internode called the mesocotyl. The node that is pushed upward becomes the crown tissue from which roots and additional tillers arise. Shortly after the coleoptile breaks through the soil crust, the first leaf unfurls. Additional leaves will quickly develop if conditions are right. Seedling: the grass plant has just emerged from the soil as a monocotyledon (one leaf-type structure). Legumes emerge with two leaf-like structures. Grass leaves may whorl and erect a "false stem", but the true stem (culm) has not yet formed. Although relatively insensitive to management because the tissues involved in growth are nestled low and deep, enough leaf must be maintained to conduct photosynthesis for rapid growth, regrowth and root system development. Vegetative: leaves continue to develop, emerge, unfurl, and die (senescence). The main function of the plant is photosynthesis. This stage of development yields the best livestock feed and managers should maintain this stage for as long as possible. However, climatic conditions will induce the next stage, sometimes called jointing, but it would more accurately be called internode elongation. Jointing: the stage of grass development during which internodes commence elongation producing a true stem (culm). This elongation is preparation for seed development. The stem is producing a peduncle that will anchor the seedhead. The elongation elevates the growing point (shoot primordium including the rudimentary seed head) to a vulnerable height. Close grazing or low mowing at early jointing stage should be avoided because the elevated growing point could be removed and alternative (below-ground) regrowth mechanisms are not ready to function. However, removing the growing point in late jointing stage can be advantageous for some grasses because it stops the plant from spending so much energy on seedhead production so the plant redirects its energies to carbohydrate reserves. Anthesis: the flowering stage during which the flowers open and shed their pollen. Grasses have perfect (sexually mature and fully differentiated) flowers and many are self pollinating. In this stage, the flowers are formed and the anthers are shedding pollen. The grass's work to produce the flower has resulted in decline of other functions, such as leaf production. The stem (culm) is more fibrous and plant palatability and digestibility declines. The grass plant is ready for harvesting seed at this stage (and before) but is not desirable for livestock feed.